Love the word; not very fond of the state. Whatever gremlins have been plaguing us have not left yet- on Christmas Eve, as I was scrubbing the Smidgen-prints off my glasses - the glasses frame just snapped in two. Not like I really NEEDED this little nudge from the universe "Dear Sir; Regarding your pending mortality..." yes, yes, I was already aware, thank you very much. Hated the bifocals when I first got them, of course- no matter which way I turned, I couldn't see- couldn't see my feet when walking anymore- couldn't read the instruments on the car dashboard without wriggling; but of course I did adapt, and they became second nature. And we are just about to go on a trip. My father is 95- and has been hollering for a visit for years. We're traveling, quite some distance, to spend a week or so with him. I'm dithering about leaving the laptop behind- that would be the first time since laptops were invented. In any case. I'll be back here in a couple weeks. Hopefully, with the new year, our gremlins will move on. And hopefully, I'll have some brain RAM freed up to devote to this blog. Just a few minutes here today; it's Christmas Eve, and we do a pretty traditional type of celebration. But it's family that's important for us, right now. I wanted to do a little post here, though; because over the past months, I've come to feel quite a few of you- are family, too. There's been lots of kind support for us through our various weird disasters; and it's truly appreciated. Happy holidays to you all- whichever the holiday; and wherever you are. New solar panels are up! As regulars here will remember, in October we had the delightful addition to our work of having our greenhouse solar power array wiped out by a direct lightning strike. We did, finally, get the panels replaced, and up and operating. That was a whole bunch of work- illustrating a number of points regarding attempts to move towards a greener lifestyle. But. Insurance has become a game where most insurers spend most of their effort figuring out how to NOT pay you anything for your losses. They sell you the policy smiling and saying "we're here to help you through bad times!" and when the hurricane hits, it's "no, no, see the fine print here? Says if the storm hits on a Thursday, we don't owe you anything! Ha! Gotcha!" In fact my business insurance company is WAY better than most- they specialize in insuring nursery/greenhouses, and that whole world is small, and idiosyncratic in spades; so they have to be somewhat accommodating just to survive. The coverage on the panels though was a little too specific to be useful, causing an extra 4-6 days of discussions before we could agree on how to proceed. The policy read "6 solar panels, max coverage $300 apiece; prorated for age; maximum liability #1800.00." What I actually lost was 6 Siemens single-crystal panels, rated 48 watts apiece, installed in 1992. All 6 were damaged by the lightning strike- which was just as well, since trying to find panels to hook up and replace half of the array would have been impossible. No, that's not me, that's Jerry, who came all the way from NY to help out. These are the panels AFTER the strike, incidentally - they look fine from this distance - but they don't work; blocking diodes melted, and some of the surface wiring between individual cells was vaporized. Took me several days before I noticed my battery bank was not getting charged. In fact EVERYTHING about solar panels has changed since I bought my first ones- in 1982, I think (the cost- about $15/peak watt.) The only option then was single crystal- and a "nominal" 12V panel put out 16.something V max under load; 19V open circuit. If YOU are the one putting the system together, yeah, you have to know ALL those numbers; they make all the difference in whether the array is going to work or not. Also, when I first bought panels, there were approximately 3 companies doing business- and the internet did not exist. Decisions were pretty simple. Not so today. There are about 25 major companies selling panels over the internet- from about 15 different major manufacturers. And there are minor ones, too. The good news is- the internet really does let you compare stuff very well. The bad news is; it still takes hours- and it's still confusing/confused after you've done your darnedest to untangle it. Let's just start with the hardware. There are now single-crystal; poly-crystalline, amorphous, wire-pulled crystal, and hybrid solar panels to choose from. At least. Are there differences? Duh. Do they matter? Hey, just read their advertising! Is there a good disinterested source that compares the types, based on initial cost, length of service, rate of power loss... fragility... track records...? Not that I could find. Actually I couldn't find even a bad, self-interested source with broad comparisons. Even digging down into the scientific reports and engineering journals didn't help. Half the technical info is on cells not available to the public- Gallium Arsenide, instead of silicon- and even more exotic stuff. Wildly expensive, and not going to be available for decades, if ever, to you and me. Just sorting out, with some level of certainty, the differences between the stuff that IS available took days. So, here's what I learned, and what I think. No real guarantees I'm right, though. When people got interested in trying to get the cost of solar cells down, they came up with "poly-crystalline" cells. They were supposed to be cheaper to make (though I don't see any real price differences today). But- originally, they didn't put out as much power as single-crystal cells; and they didn't last as long. Today, their specs claim they DO make as much power- and the 20 year/80% output guarantees are very similar. But. When you dig down- it seems that the RATE of power loss is still higher for both poly-crystalline and amorphous cells; single crystal cells lose power at something like 1% a year for the first 25 years; the others may lose power at 2-4% a year for the first several years; then slow down the rate of loss. Amorphous cells rarely last longer than 10 years before needing to be replaced- they're just not as durable. Cheaper, flexible, lighter weight, but not going to last- barring lightning (or earthquakes, tornadoes, or what-have-you), a good silicon array can be expected to function adequately for - FORTY YEARS. Eventually I decided I did want to go with the old single-crystal cell type. Mostly because they've got the track record. Some of the newer types are a little more efficient- but they haven't been around for even 20 years, so we don't exactly know how they'll be doing down the road. Ok. Now- which ones? Made by whom? And, what does that all mean? Basic translation: "these panels claim to be 175 watt output, but "Standard Test Conditions" are unrealistic; slightly more realistic ones suggest 131 watts is a better average guess; and if it's a little cloudy, subtract more. These are "nominal" 24VDC panels- which is why they're putting out 35.7V under good conditions, of course- so your 24V batteries actually get charged." Getting a headache yet? I sure was, around day 4 of trying to sort this stuff out. Slight aside #1: if you're thinking of getting solar panels- or a wind generator- do you really have to know all this technical stuff? Answer: It's very much like getting your car fixed. You either have to be able to do it yourself; or you need to be able to TRUST your mechanic. There are plenty of mechanics who will rip you off if they CAN. "Hey, your infrahydraulic-frammulator is totally clogged! Dangerous to drive with it that way! I can put in a new one for only $320!" Unless you know SOMETHING about it all; you're at risk of being ripped off, but good. And the more you know; the better. Not to mention that even good honest mechanics DO sometimes make boo-boos- and it helps if you're paying attention- knowledgeably. The good news again- is the internet. You CAN educate yourself enormously faster, and better, than you could 15 years ago. But you still need to go into the process with your brain turned on; and be aware that there are thieves and liars on the internet, too. Surprise. Two panels; instead of 6. And they're 24VDC instead of 12 (greenhouse battery system is 24V.) Those numbers above are for these panels; nominal 175 watts. Basically, as more folks are installing solar arrays, the available panels have been getting bigger- and cheaper. Some economies of scale do seem to be kicking in. These panels were advertised at one site as $4.60/watt - which is CHEAP. Buying 50 watt panels to replace my 288 watt array would have cost me over $6/watt, best I could find. Some good incentive there for me to go just a bit larger; I can always use the extra power. Now- which panels, exactly? The basic specs on a lot of panels have changed since I last bought some, 10 years ago. They all operate at slightly higher voltage; and they ALL come with built-in blocking diodes; something my first ones didn't have. All that is good- part of the learning process I'd helped pay for, by buying the early stuff. And yes, I intended to support a growing, immature industry, by paying outrageously high prices for electricity- when friends and advisors kept pointing out "that's not even close to a competitive price for power, you know." I knew. We need to support green processes with our own dollars- they'll die on the vine, otherwise. Picking a manufacturer was an odyssey, too. In case you haven't noticed, the big petrochemical companies have been buying up the solar cell manufacturers. Eww. The first panels I bought were Solarex. They were among the first to sell to consumers; based in Maryland, I think- big plans for building a "solar breeder" plant; where all the power to make their cells would come from... solar cells. BP (British Petroleum) bought them, quite a few years ago now- so BP can print tons of ads about how wonderful BP is, for doing all this advanced research on solar power. Same thing happened to the Siemens solar division- which made the panels the lightning hit. They were bought out by Shell Oil. Double Eww. I will run out of gas, and walk, before I buy gasoline from Shell. Long story. Then I ran into very similar panels made by Conergy- which, it turns out, is a German company. Cheap, too. Except. As it turns out. When you dig into the technical sheet - THESE particular German panels, imported into New Jersey, are actually made in China. Which you can really only tell IF you can decipher their product code- they don't exactly brag about it. Now- I'm the opposite of a China-basher. I love the place; love the people, and I think as a country they have huge potential, if they can just avoid making all the mistakes we already have. Sure, they have some corrupt politicians and greedy businessmen - uh - SO DO WE, in case you haven't noticed. They also have huge numbers of very good people, including some politicians and businessmen, doing their darnedest to make China; and the world, "work". But it IS on the other side of the planet- and the energy required to ship them just doesn't make environmental sense, as we know. I'd rather pay more money for panels made somewhere closer. Back to the drawing board. Digging to find out who they are- turns out, it's a German company, with what looks like a good track record- and - guess what! These panels are being made in the California factory that they just bought- from Shell! Who bought it from Siemens. Round we go. I liked the quality of the panels I'd had - these are probably made by the exact same PEOPLE - and Shell is now out of the picture. The engineering and manufacturing is critical on anything that SHOULD last for 40 years. These guys seem to know how. Ok, we have a winner. I didn't buy the panels where they were cheapest. A) they didn't answer my emails; B) their website was a little slick and short on information; C) they shipped from the east coast; and these panels are made in California. I bought my two panels (a tiny order) from a company that ships from California; and they answered my emails, and even called on the phone to see things were going ok with the order. The panels arrived on a semi (too big for UPS) - like 2 days after I made the order. Took several more days to get them installed; the old mount really could not accommodate the much taller panels; we managed to modify the old mount with some new steel; lots of sawing and drilling. Used an old "post drill" hand powered drill press to make most of the new holes in steel. Then took most of another day to get the panels bolted on, and wired (VERY CAREFULLY). And we added MORE lightning protection; another ground rod, just for the panels; heavy ground wireS. With any luck; it should be good for 40 years. That's most of the story on replacing the panels. A huge part of my reason for detailing it here is to highlight the real difficulties of sorting out "what's green; what's greener; what's true; what's false; what's real; what's fake..." out here in the real world. That's a topic that's come up several times in all the blog conversations I check into; for example No Impact Dude; Chuncky Chincken, and Green as a Whistle. And others. Just the topic of "exactly how useful/green are Compact Fluorescent Lightbulbs" turns out to be complex enough to keep people writing about it, including me. At the moment there's a serious shortage of authoritative and trustworthy voices on green consumer practices, and a worse shortage regarding particular practices. The US Federal Govt. occasionally puts out some good comparative data- sometimes very extensive- BUT; you really have to dig for it, often it's in a weird incomprehensible form, and sometimes- it's biased by politics. 1) Get everybody to understand that you have to take ALL "this is green" statements with a grain of salt- and do some homework of your own to see if you can believe it. And always will. 2) SOMEBODY (not me, I'm really busy) needs to found a green version of Consumers Union; the publishers of Consumer Reports. They're non-profit; never accept advertising from ANYONE; forbid any maker to use their name to recommend any product (and they'll seriously sue when someone does)- they really try hard to be independent. Perfect? no; always right, no- but the best thing I know of out there in terms of thorough independent testing and information. But they're not about to take on this chore of green certification, on top of what they already do. We need a new organization. Somebody could make a good living doing that, actually, very fairly; and provide an invaluable resource for the rest of us. And, such an organization could start to push for changes (Consumers Union members have considerable political clout) - like- how come, when you're buying a computer, or TV, or something similar- you have to absolutely BEG for the information on power consumption? Why isn't it listed right up front; always? Why don't businesses like Gaiam, which totally focuses on being "Earth-friendly" - actually give you the numbers? What they say there is "Energy Star Compliant." Oh, be still my heart. What that means is; some bureaucrat thinks the energy use is "not too bad". I WANT TO KNOW EXACTLY. I NEED to know, exactly- because I'm off the grid; and every photon counts; today. I not only want to know their "wattage" - which tends to be kind of meaningless - but I want average power consumption under 3 conditions; max load; half load, and light load. Because EVERYTHING varies on how much power it actually pulls. And I want numbers for average watt/HOURS/day, for each of those conditions- because a watt is just a measure of instantaneous power use- not power consumption per time. We label our food like we care about it. We've GOT to start labeling our energy consuming devices the same way. The government is NOT going to do this, anytime soon- we're going to have to demand it, ourselves- and there's almost nothing out here, as an organized, authoritative green voice. So. Who's going to DO it? You? And what the heck is a weep hole? Something quite real, and critically important to me right now- and a metaphor too, for larger difficulties facing us all. We've got winter this year; kind of a surprise. According to the Minnesota weather people, we've got the earliest, heaviest, and most widely distributed snow cover in over 10 years. We had a white Thanksgiving, which the oldtimers here say used to be far more common than the rare brown Christmas. I can remember 5 brown Christmases out of the last 10- and a couple that were borderline. It's cold. Down to -8°F last night; 8 below zero. We get our water for the Little House from a good ol' Aermotor windmill. It's frozen. Because the weep hole is blocked. This is a windmill I put in, shortly before Beelar was born, 30 years ago. I watched the whole process avidly, the entire well-drilling process, installation of pipe, erection of the used windmill - and I kind of freaked out when our well-guy took out his file and - cut a hole in the pump pipe. "What in the heck are you doing!?" I asked quite proprietorially. "You're making a LEAK in my pipe??" The well-guy was quite calm about it- he'd obviously been here before- "That's the weep hole." He explained. "You have to have one, to keep the well from freezing. Most guys around here put the weep hole about 6 feet underground- I put it 8 feet. I've seen it freeze 8' deep here, once every 15-20 years. It's just a little hole- you don't lose much water; and it lets the water drop back down below the frost level when you're not actually pumping. If you don't have a weep hole, the water will stay right up at the top of the pump- and freeze solid in any kind of cold weather." Ah. Ok. So, my well has to leak a little, in order to work all winter. I'd had no idea, of course. Mostly, these days, water systems in northern locations just keep everything down below the frost. Mostly. Here was a totally simple bit of old technology- that almost everyone had forgotten. Luckily for me, I found someone who still remembered. What a mess. All this was not something I could fix on my own, had to pay folks to do it. Found a different well-guy this time, a local Amish man who did regular work on windmills for his community. Should know what he's doing, I figured. Alas- he'd recently moved here from southern Ohio. They don't use weep holes- don't need to, where he had grown up. He kind of knew about weep holes; but it wasn't something on the top of his mind- so after servicing the well, replacing the pump leathers after 25 years, he put it all back together- with the weep hole still blocked. This time, at least I was watching for problems- so was able to prevent the windmill from ripping out the sucker rods again- but we spent a lot of time hauling water from the greenhouse well (pumped by solar power, with a modern "pitless adapter" below frost). Far more work than just having a house well that worked. Next year- found a different well-guy; got the weep hole cleared out, and slightly enlarged- since something seemed to be blocking it these days. Worked fine for a whole winter- and now, it's blocked again. And frozen. Sigh. Hauling water from the greenhouse again. The most likely cause of the blockage is an increasing presence of "iron bacteria" in the well, slowing building biofilms on everything. Possibly it just took 20 years for the iron bacteria to become a problem. The metaphor part- our world is built on technology. Our lives depend on it. And a huge proportion of critical processes are increasingly understood by fewer and fewer people. Going back to Rome- at the peak of their civilization, they had incredible roads, incredible city/province wide water systems, sewers, passive solar heated housing, floors with built in radiant heating- and on, and on. But as their world aged, with fewer and fewer "spare" resources for anything beyond immediate survival needs- the technology failed, and disappeared; for centuries. Eventually, no one understood how it had been done- no one remembered how to do it. Our own world is orders of magnitude more complex. It worries me. Just my cheerful thoughts for the day. Spice is doing better, as am I- but we're not quite back to full speed yet. Guest post- the Caped Crunchy Strikes. It has indeed been too long; sorry about that. Just going through some complex/tough patches here, and I don't really want to burden everyone with every little silly thing. Found this in my mail this morning, and it made me smile a lot. An excellent nudge, Crunch. Thanks. I DO have a new post in the works here; within a couple days. I hope you guys are doing okay. I noticed it's been almost a month since you've had time to post anything on your blog and I'm sure your readers are getting restless. This is a "good news, bad news" post. Life is like that, it seems sometimes, one long illustration of "the bad news is, he fell out of the airplane... good news is, he landed on a haystack... bad news is, there was a pitchfork in the haystack..."
The good news is, the BBC posted the truly startling, and encouraging, results of a large multinational poll today - "4 out of 5" people believe humans will need to significantly alter their lifestyles in order to cope with climate change- and they're ready to do their part. More than 80% in China, and more than 75% in the USA. Those are pretty big numbers- the iceberg IS moving, and in the right direction. And I positively guarantee you- YOUR ACTIONS have been a huge part of making this happen. "Yeah, I know it sounds crazy, but my neighbor Bill is worried enough that he's started biking to work." Etc. Those are the tiny little pushes that actually get folks to pay attention- and think- and change their minds. Add it all up - our individual actions are powerful. The bad news is, the Little Blog did finally attract a "troll", and I did finally delete ONE comment for just being, well, sub-human. As Hank pointed out, feeding trolls makes them come back, and I accidentally fed one in the comments on the last post - "Anonymous" (#2). I put his first comment up (and will leave it), not recognizing him as a troll- though Hank did. He was sly- he sounds reasonable, conversational- but ultimately it was just a cranky dig. The one I deleted was more obvious, and pointless. Partly I put it up because I am acutely aware of the dangers of just talking to ourselves. If we all agree, all the time- something is wrong. And I have no problem with honest, polite disagreement, as I hope I've shown. Then; the bad news is... we seem to be running a streak of crummy luck, if you believe in such things. Besides having our mowers flooded, truck stolen, solar panels fried by lightning, having my back go out, and getting our mailbox bashed; a week ago Spice was in a car accident. The other vehicle failed to yield, at a rather poorly set up intersection of rural gravel roads... and she wound up in the ditch, windshield smashed. It was a side impact, so the airbags didn't go off- so.. according to MRI scans a couple days ago, she does indeed have "whiplash" injuries; torn ligaments in her neck and shoulder. Smidgen was in the car- strapped into her car seat, in the back, and is fine, with a little bruising from the straps. So that's part of why I've been a little short on entries here- we're going to have to take some time off, from everything, so Spice can heal. No cheating- she's got to rest, much of it in bed, no stress on the ligaments. Which means I get to carry the wood; and the water; and do most of the cooking, and dishes. And a lot of Smidgen herding. I admit I get tired of playing the stereotype "doomsayer" - "voice crying in the wilderness" - etc. It isn't any fun, in fact, saying things people don't want to hear. They call you names in return. Ten years ago, I was one of the very few scientists willing to say, in public, to an audience of farmers- "Ethanol from corn is a bad idea." I made no friends. Here we are, however- with even the farmers (who have the most to lose) now admitting that ethanol from corn "has limits" regarding how much of a fix it is for anything. And no, I don't blame the farmers for the ethanol rush- they rely a great deal on "experts" to suggest good directions for them. We're already past "Peak Ethanol." Ethanol Glut Why? Because folks ignored the fact that technologies must be INTEGRATED; all the pieces have to fit into the real world, somehow. Ethanol has a dozen aspects where the concept will NEVER integrate with the needs of humans, or the world; but the one that has currently caused the price of ethanol to drop, and has caused plans for new ethanol plants to be canceled was obvious all the time; and talked about, and explained, and ignored: the corn is in the Midwest; the demand for fuel ethanol is on the coasts. You can't move enough of it, fast enough, to make it work. B) you can't put ethanol into the existing piplines anyway; it will corrode them. D) there aren't enough trains; or trucks - OR TRACKS OR ROADS. E) nobody is building new tracks, or roads, or is intending to in the future. We KNEW all this. And yet- neither our beloved government; nor our beloved universities, nor our blessed free enterprise system prevented us from idiotically going down this path. What stopped it was- hitting the end of the trucks and trains. They're full, and going as fast as they can, and the ethanol producers are already producing more than they can handle. What does the future hold for ethanol? It's still kind of a sacred cow, out here in corn country; badmouthing it will not make the neighbors smile at you. But the reality is, everyone knows its days are numbered, and as a growth industry- it's over. The new fantasy the experts are selling is that all those lovely corn ethanol plants will one day be converted to producing... ethanol (what transport problem!?) - but from switchgrass, instead of corn. Ethanol from switchgrass IS NEVER GOING TO WORK. Or Butanol, or "bio-crude", or whatever; from miscanthus, or hybrid willow, or "cellulose". The systems required do not work; and cannot be made to work; this is a blind alley; a waste of resources needed to find real solutions. So why so much noise? There's money to be made "developing" the new energy messiahs. $$$8-). Otherwise sensible people can just get sucked right into the fantasy when you wave million$- billion$ - of dollar$ at them. And, this fantasy perpetuates the delusion that we can still have all the SUV's we want. Lots of people are hanging on to that mirage for dear life. I'm wincing as I write this; because I know I'm going to make a bunch of people angry. I really don't enjoy that, it's no fun being a target, and angry people seldom listen in a reasonable fashion. That, however, is exactly the problem; this entire discussion is not taking place reasonably- it's highly emotional, with a careful avoidance of rational dissection. Here are the multiple reasons, in order of intractability, in modest but not complete detail. And for those of you not aware, this IS an area where some consider me an "expert" - I've been asked to speak at multiple conferences, including one specifically on "cellulosic ethanol". (Photo borrowed from the National Renewable Energy Laboratory, www.nrel.gov/data/ pix/Jpegs/03246.jpg). Look at the picture- then see yourself touching a match to the base of that dry grass. This stuff is HUGELY more flammable than corn, or wheat; both of which sometimes burn before harvest. It's the definition of tinder- explosively flammable when dry. Assume that the whole fantasy is in full swing- you'll wind up with hundreds of grass-to-ethanol processing factories around the country. Each of these processing plants will be surrounded by... hundreds of thousands of acres of .... switchgrass. Millions of acres, altogether. Close your eyes, and see it: hundreds of thousands of contiguous acres- of DRY grass. 8 feet tall. It has to be big, mature, and dry- for any of the fantasy to work. It turns out that if you cut it when it's green, you seriously weaken the roots- no crop next year. And if you cut it when it's green- you'll either have to use it right now, or spend energy drying it, so it won't rot. Are those huge fields of dry grass going to burn? Yes, they will; and many times, the fires will be uncontrollable. Lightning. Sparks from harvest machines. Bubba, on Saturday night, after 8 beers, because it's fun. Revenge, after getting fired from the plant. Arson by hirelings of the petroleum industry. Arson by your switchgrass ethanol competitors, to bump their profits up. Terrorists, perhaps. And. What will be the cost of maintaining fire fighting teams enough to pretend to cope with such fires? Lots of fire teams. Add the cost to the price at the pump, and be aware that just like in California last week, sometimes they're powerless. And sometimes firefighters, and others, die. Will such fields always burn? Of course not. Will they burn often enough to make the whole proposition uneconomic? YES. Not only the grass will burn, of course- how many houses did we just lose in California? Any switchgrass growing region will be uninhabitable. Would you live in a house, raise your children, surrounded by switchgrass? I wouldn't. Other cellulosic feedstocks will have similar fire problems, even hybrid willow. In order to be economic, these intrinsically flammable materials have to be grown in the highest density possible- increasing the fire hazard. Regardless of climate, a dry spell will occur; and Bubba, or lightning, will go to work. The profits will be out the window, the company will fold, the system will shut down. a) "Well, you could put in firebreaks." Flames from mature switchgrass typically rise 50 feet into the air. Take a look at any of the videos coming from California last week- wind driven fires will jump almost any break you can make. 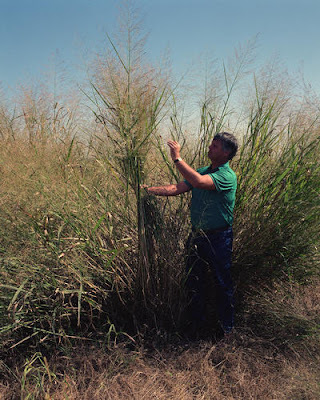 Switchgrass is virtually designed to generate airborne sparks- the myriad leaves burn loose, then take flight on the fire generated winds- burning. Bubba, I guarantee, will wait for a windy night. And in any case, allotting substantial ground to firebreaks will cut into the economics- your grass resource will be even more diffuse; transport even more expensive. "I don't think so" is hardly an adequate response. In this world of global warming, we can count on warm weather- and dry periods; getting worse. c) "Look, technology is astonishing these days; we'll figure out something later." See nuclear waste. This is the attitude responsible for so many of our problems these days. We have to stop accepting it in the planning phases. "I know coal is dirty, but we'll figure it out..." Etc. The idea that we can solve any problem eventually, is not proven. See cancer. d) "How dare you run down my fantasy! You have to give these things a chance! You're just being mean!" sigh. No, I'm not. I'm being a parent. I want Smidgen to have a real chance at a future- and I want hard answers to hard questions. I'm sorry if you think I'm kicking your puppy. But you don't actually have a puppy to kick- it's imaginary, and its legs were broken before I got here. What? I hear you say. What has "storage" to do with all this? Nobody ever mentioned storage before. We're talking here about setting up a large scale industry. All the pieces have to fit together. If you build a fuel making factory, I guarantee you it will need to run 360 days a year in order to make a profit. Could you build a car factory and run it for 2 months a year? Nope. Corn-ethanol plants run 24 hours a day; as many days as they can. These kinds of biological fermentation processes are hard to start; hard to shut down; best kept running. Dry mature switchgrass is available to cut in the field for at most 2 months out of the year. February-March-April, depending on your latitude. If you're going to run your factory the rest of the year, it's going to have to be running on grass you have stored somewhere, somehow. Many tons, per DAY. Can you just bale it up, and leave it in the field, the way they do hay sometimes? Eh. Not very well- if it's sitting in the field; no grass will grow where it sits; and somebody will have to come get that bale, with a tractor, at some point- driving over the growing grass. Those are significant costs to the system. Baling is not free- it has to be done exactly right, or the bale will be subject to wetting in the rain- which will make it start to rot. Your fuel value is disappearing, as it sits there. Hay bales are sometimes wrapped in plastic these days, to slow the wetting problem. More expense; more plastic. Could you store the bales somewhere else? More land. And a roof- piles of wet hay are a favorite source of fires- the heat of composting can build up to the combustion point. That's a really big roof- expensive. The whole process of harvesting, stockpiling, storing- is very far from trivial. What we already know about storing grass, learned from experiences with hay, indicates that scaling it all up to the huge levels envisioned is not at all straightforward. And may just not be economic; ever. There IS talk of "pelletizing" the grass; milling it into uniform particles, forming it into uniform pellets. Yep, that would make some of the handling easier, but it would add a tremendous amount of energy input to the process (higher price at the pump) and still would not get rid of the need for huge huge amounts of storage space. In order to be useful, the pellets would have to be very hard- or they will crush to dust in the storage bins- more energy inputs, and possibly material inputs- glue. Ok, this is getting long. That's because we're talking about a really big, complex topic. But I'll try to wrap this up; realize that I'm cutting the discussion down to the bones; there's far more I could be saying here. Problem #3) "We expect it to be working in 5 years..."
Yes, there are demonstration plants currently making ethanol from cellulose. The dirty little secret, though, is that ethanol made this way is costing 3-5 times more than ethanol from corn right now. The energy inputs are huge, the yields are poor. Can it be done? Sure. Economically? Not.... yet. I'll give you a hint; when a researcher says "We confidently expect our spiffy new process to be fully commercial about 5 years from now." - keep your investment dollars deep in your pocket, and run. What they're really saying, in researcherese is "we're stuck, we desperately need a breakthrough, and have no idea if or when one will happen." If they say "We expect to have a product in one year!" - that means they actually have a research direction established. Expect a real product in about 3 years, at the earliest- and a test of real world functionality in 5 years or so. When they say "we guarantee to have this figured out in 5 years" - it means they have no idea which way to turn. Not kidding. The track record of the "biotech" industry is quite clear. After decades of promises and billions invested- they have virtually no products that work. Truly. Biotech Investment . The Fabulous Promise Of Biotech is pretty much a bust, apart from a very few simple products. The overwhelming reason is that lab-born scientists have a casual contempt for nature, and a universal tendency to underestimate natural complexity and the astonishing sophistication of natural systems. HIV Vaccine Abandoned. Sorry to be so rude about it. It's their track record; not mine- extensive promises; few deliveries. In detail, what they're promising now is that "soon" they will find a magic enzyme; or two; or they'll make one, from scratch, that will immediately make it possible to toss raw cellulose (ok, or lignin/cellulose) into their kettle, and have great quantities of (clean) ethanol popping out the other side. Here's my big chance to become known as a prophet. No, they won't. Think, please. What is cellulose? It's a big long string of sugars. Hey, that should be easy. It's also the basic structural molecule in... bacterial cell walls. And, oh, yes, plant cell walls. But it's the bacteria that interest me. They've been around for a long long time; billions of years at least. And in all that time, other bacteria, and fungi, and what have you, have been constantly trying to figure out ways to break into the cells, and eat the goodies in there. And the bacteria have constantly been figuring out ways to prevent that. Layer, upon layer, upon layer of attack and defense. Both the bacteria, and the plants, are extraordinarily good at preventing breakdown of their cell walls. REALLY REALLY good at it. Billions of years, good at it. But hey, we'll figure it out in 5. Take a look out your window. Any trees out there? Grass? They're all made of cellulose, and they are all busily preventing anything from eating their cell walls. Do they succeed? Manifestly, yes, they do. Granted, when the plant dies, the cellulose will eventually break down. But very very slowly, and usually it's the last molecule to go. Ever see a dead tree suddenly turn liquid? That's what they're saying they'll be able to do, in 5 years. Believe me, the fungi and bacteria would do it now, if they could. The biotech boys are already aware of some of the difficulties, since they've actually been working on cellulosic ethanol for at least 20 years (that's Four "just five years" ), and don't have it working yet. Turns out the cellulose in there is just really hard to get at. If it was a naked string of sugars, it wouldn't be so bad; but it turns out cell walls are incredibly complex; and most of the complexities are... SURPRISE! - kind of specifically there to prevent anything from attacking the cellulose. And.. SURPRISE!! when you break down one barrier... there's ANOTHER one waiting. Well, I'll be darned. Oh. And another. Take a look at lignin, and all the tangles there. That's what happens, given a couple billion years of microbiological warfare. Oh, and, just incidentally. Suppose the Biotech Boys DID come up with a magic enzyme, able to eat any cellulose, anytime? Wouldn't that be a nifty thing to turn loose, accidentally, on the world? Every hear of the nanotech "Grey Goo" nightmare? Say the magic enzyme accidentally gets incorporated into a wild fungus... (not at ALL unlikely) which gets out into the woods... how about "Brown Slime", as the end of the world? We haven't even gotten through all the major non-scifi barriers; like #4- Water - and #5 -Plant Disease in a Huge Monoculture - #6 - Food (UN:Biofuels Criminal), and Transport...and on, and on. My point - is not that all research on cellulosic ethanol should cease. My point is- we had really better be looking for other answers to our problems. This one is very very far from being a sure thing. If I were an AntiBushkovite, I'd ask when was the last time any good idea came out of Bush's mouth. And claim that his optimism on switchgrass is abundant reason to abandon it immediately. But I won't go there. My plea is for hard, hard thinking, before we commit our hope and precious resources to blind fantasies. We don't have time or resources to waste. We need more discipline in our projections for the future. Does this work? Does this fit in place? What happens next? And next? The only workable solution within sight for our energy disasters, and global warming, is that we must all use much less. And as long as we indulge in the insane dream of an SUV in every garage- in India, Africa, China, and Mexico- we will not face the reality that we all must learn to live quite differently, and soon. Today, I'm fondly remembering yesterday. Yesterday I "made wood", pretty much all day. Yes, in spite of the crummy back; forced by the additive realities of cold weather, an approaching trip away for me, leaving Spice and Smidgen at risk from a non-existent supply of dry wood, and an incoming rain storm- now or never. And the reality that the more you rest, the weaker you become- inviting re-injury whenever to attempt to start working again. The back is not back; but being careful, I could manage, and the need was critical. I succeeded; excellent firewood was brought into the shed; enough for now. Today I burned up my accumulated spiritual energy tackling FEMA, formally filing the claim for the flooded mowers. That was a mixed experience- the invitations to do it all on the web uniformly ended in "failed to load page" - or something similar. Eventually with great trepidation I resorted to the phone- and met Lydia; who was a delightful and competent person. Whew. The end result of all the filing and filling in of blanks is that the NEXT set of forms to fill should arrive in "from 7 to 14 days" - if they can figure out why my zipcode is not the one the computer insisted on automatically putting in. Lydia assured me she'd tell "them" about the zipcode glitch. One can hope. At any rate- our claim is now "in the system"; we have a number. Whew. The process of getting in a pickup-load of wood, (we bought a replacement for the stolen truck; had to) with a dicey back, reminded me forcefully of the tremendous amount of art involved in firewood. And, I will arrogantly admit, I am an artist where firewood is concerned. I love the whole process; from finding the tree, to the whiffs of smoke; and even the spreading of the ashes back in the forest. And the warmth; the hot coffee, pot roast, soup, new bread, and warmed hands. At every step- there is a great deal to know; right ways, wrong ways, easy paths, and hard ones. My being out of shape with the iffy back enforced the practice of the art: artfully done is easy; and effective; carelessly done is hard work, inefficient, and dangerous. First- the tree. I'd been watching this tree for at least 5 years, with firewood in mind. It was dying 5 years ago; dead 3 years ago; and drying out since then. Ready, now. This was a 60' tall red elm (Ulmus rubra); also called slippery elm; one of my favorite trees, for many reasons. Killed most likely by the "Dutch elm disease", which is still very active here; red elms die much more slowly than American elms, though; and some don't die at all. Elm has a bad reputation as firewood- because of American elm, and some of the other species. Mostly elms make good fuel; if you can get it into the fire before it rots. Most elms are treacherous to fell; they can be huge, but riddled with rot only a year after they die, making the top into what loggers call a "widowmaker" - while the tree is falling to the north, a huge chunk of the top may break off under the stress- and fall south; on you. Red elms don't do this; they can stand dead for 10 years, and never rot at all. Elm in general is one of the rare woods that actually dries out while standing in the woods; an oak can be dead for 6 years and will be wetter than the day it died, red elm is as dry as if put through a kiln, all but the bottom 5 feet, 2-3 years after it dies. Most elms are renowned for being "unsplittable" (unless you've got a heavy hydraulic splitter) - the fibers intertwine; but red elm usually splits like oak, straight and straightforward. (Ok, I said usually. Yeah, I've run into some that were hard to split- but I've now learned to identify those before felling; you can see it in the skin of the tree.) And, finally, elm is supposed to stink when burned; the farmers' name for American elm around here is "piss-elm", for that reason. Red elm, though, smells like incense; and the freshly split wood to me smells just like a shop-full of Japanese wood carvings; something I remember acutely from my childhood. No one disputes the fuel value of elm; it's good hot wood regardless of species. I'll burn American elm if I have to; and rock elm any time I can find a small one dead for exactly one year. But those trees are essentially unforgiving; 10 things have to be exactly right, or you're wasting your time. Red elm is my friend. These days, much of our firewood comes from trees we planted ourselves; that's a different process, a different art; and includes drying wood already cut. But we got 15 inches of rain in August. All our cut, stacked new wood is now soaking wet, no matter how dry it was in July. So it's back to the Big Woods, where the red elms are dry, no matter what; the standing trees have no end-grain exposed to absorb the rain, so it just runs off. Second- felling. Don't guess; don't hope. You really need to KNOW where it's going to fall when you cut it. Sure, I learned a lot of that the hard way, including fun experiences like dropping a pine right on a pickup truck (not my fault, but I was there!) and having trees tangled in neighboring trees so it took 4 years for them to come all the way down. Those things are ALWAYS avoidable; caused by just a little carelessness, and often by being in a hurry. Don't hurry. Really. This tree was leaning a little the wrong way; oh, about 7°. Solution; a rope, and some people pulling on it. Sometimes just one person pulling will be all you need; just a little insurance. In this case, we needed more- it was a heavy tree, headed right for a 4-year tangle if it went where it was leaning; 3 people. 60 foot tree- 100 foot rope, so your pullers are out of the reach of flying branches. 1" polypropylene rope. NOT nylon rope, it stretches, most of the force you apply just gets lost in the stretch. Natural ropes like sisal are not bad; but they rot in time; I've had this same polypropylene rope for 30 years; it's the same one I built the house with, and probably still has 90% of its original strength; no sign of wearing out. Made a slip-noose with a bowline knot; the forces you're dealing with here are very large, it's easy to wind up with a knot jammed so tight after the tree falls that you can't untie it; bowlines never slip, and are always easy to untie. I ran the chain saw, Spice, Middle Child and MC's spouse were on the rope. Smidgen was in the truck, watching from well away. It didn't go as smoothly as I'd like. I prefer a deep notch, more than 50% of the trunk, for a leaner like this. When I started the felling cut from the back, I yelled "PULL" - but when the tree finally started to shift- it sat down on the chainsaw blade; falling the wrong way. Not moving, but not good. "PULL HARDER!" And, luckily, 3 people pulling harder was enough to move it off the saw, and get it falling the right way. Whew. But not quite as planned; it was supposed to drop on the road, but because I miscalculated the cut a tad, it dropped just to the side- slightly hung up in a small hop hornbeam tree. But workable. Hey, the top of the 60' tree wound up 15' west of where I wanted it to be; so sue me. In retrospect- yeah, I was a little hurried on the cut. Don't hurry. I knew that, of course, which is seldom enough for us humans. Ah, well, I gave Middle Child an opportunity to smirk at me a little; since he's a perfectly competent man with a chainsaw himself. That's a good thing; I figure I owe my children plenty of amusement, since they've amused me so often. Third- disassembly. Once you cut the tree down, you cut it up, a source of perpetual humor for me. Now, I was alone; not the preferred policy for safety purposes, but reality for any farmer; sometimes you have no real choice. So when you have to work alone; you get really really careful. And slow. And these days, with a two-way radio in your pocket. Chainsaws are fantastically powerful tools- which means they can kill you in a second if you do something stupid. Slow down. The crummy back meant going slow, too- don't overdo. Who could ask for better meditation? Chainsaw Tai Chi. Thoughtless cutting will quadruple the work- the piece won't fit in the stove- etc. Slow, think ahead- pays huge dividends. My back is complaining- change the footing, so the angle of the weight of the saw is eased. Rest. Must not push the back too far. Much of the trunk must be split to go in the stove. Swinging the ten-pound splitting maul is another art; you can let the maul, and gravity, do the work; or try to force it through the chunk with all your muscle. I'm lazy; I'd SO much rather do it the easy way. Swing-toss it up in the air; tug it down in the right direction- and DON'T think about aiming it. This part gets seriously zennish. If I'm paying no attention to aiming the maul- I'll hit the chunk dead center. I mean exactly dead center, I'll stick the blade of the maul right into the center ring of the tree. Every time. Until I start paying attention. And if two strikes are necessary to split it; I'll stick the maul smack in the crack from the first split; every time; unless I'm paying attention. It's absolutely fascinating for a biologist; how is it that the mere act of focus results in such consistently poor performance; where paying no conscious attention results if absolute precision from truly daunting variables? This chunk is not the same as the last; it's not the same shape or size, not in the same place, the ground under it is tilted; my footing is different: and with no "higher" processing, I hit it exactly right; over and over. It's a joyful thing, when the chunk splits effortlessly; and funny, when I start noticing, and start missing; and joy again when I successfully manage to NOT pay attention once more. It IS art, and the result of years of splitting; I started splitting firewood when I was 14 or so. Fourth- tossing the pieces into the truck. Again- it can be easy; or hard. I toss two or three or four at a time, depending on size; swinging the weight of the wood like pendulum weights; releasing so it goes into the box, not over, not short, and not through the glass on the truck cab... Bend over; stand up- swing; release (not throw); use the arm momentum to get back down for the next pieces. More Tai Chi, sort of; rhythmic, steady, purposeful. Fifth- getting the wood from the truck into the shed, out of reach of rain or snow. This involves my macho wheelbarrow; a 10 cubic footer, with TWO wheels, and a trip of 100 feet, very slightly downhill. Load the barrow; don't smash the fingers (gloves! ), wheeling, guiding; don't tip it! Balancing; don't let it run away; dump into the shed; toss again, into the final pile. Done. No rain, yet. Back, arms, hands tired- but not hurt. You were a huge help- got lots of stuff done that had been dangling, waiting for the extra hands. The side effect though, was some brain fog- re-focus here, re-focus there. Now I've gotta re-focus again, on coping with just us. And, for extra fun, I sneezed this morning. Ha ha. If you've had your back go out, you know a sneeze is not amusing, and indeed it put my partially recovered back back into spasm. Hopefully minor, it doesn't feel like going back to square one- but it's definitely a problem. Meanwhile- the weather is apparently Augember. Late August temperatures, but November rain patterns; day after day of gray drizzle. Nov/Dec is when we need our backup generators the most, usually- it's common to have weeks of no effective sun; Jan/Feb are VERY sunny, usually, and though the hours are short, the power is good- something few people know is that photovoltaic panels are more effective- the colder it is. This is not a minor effect- you get around 1% more power for each 3°C colder than "rated" temperature. Usually panels are rated at 25°C (which is pretty fakey- in full sun, in summer, they're probably running more like 50°C- which means a lot less power). In winter though; it's pretty common to have bright sun- often bouncing off snow; very cold temps; and wind- so the panels may be running at a temp of -30°C; which should mean around 20% MORE than "rated" power output. I learned this the hard way; by boiling my batteries one nice February. See? Brain fog. Starting to ramble. Today we've got 12 hours of sun and wind- before the rain starts again. Have to get some firewood in before the rain comes back; we ARE needing the stove now. The Little House has big windows, by design, and in 50°F weather it will heat nicely, if it's sunny- but if it's drizzling day after day, it gets miserable without the stove. Hopefully this won't scare anyone off from trying to go greener- but... we just got hit by lightning; for the second time this year. First one took out the well pump for the greenhouse. This one took out the solar array for the greenhouse. Yes, the whole dang system is professionally grounded for lightning. Lightning, alas, can ignore your nice grounds if it feels like it. This is what it looks like; melted junction boxes, with cooked diodes. Every panel in the array got something melted. On the up side; that solar array has been working; flawlessly, and with NO maintenance (unless you count wiping snow off) for 14 years. Not so bad, really. But it's a major headache at the moment. Yes, it IS covered by my insurance this time. With some deductibles, of course. The problem for me is; this particular model of panel is of course no longer made. And newer panels- aren't the same size/shape. So they won't fit on the existing mount. So I not only have to find new panels, but erect a new rack. In my spare time. ha ha ha. The storm, of course, came when the hot weather finally broke- and it went from 85°F on one day, to 45°F 24 hours later. hm. Time has been sneaking past me here; perhaps I could blame it on the medications for my "out" back. Or just the blur of constant work. Our harvest is still going on, and will for a while yet. The back is better, but not entirely back. Slogging on. I was tickled by several of the recent comments here - one stating they liked the glimpses of real life best, and I could leave out the general discussion; another glad to see I was making "real" posts again, after a bit of an enviro rant- must be doing something right; if all parties are equally happy and displeased! I'll continue to write both- partly because I need both for my own sanity. It does get frustrating, pushing on icebergs and not seeing anything happening. The rants help blow off steam, and who knows, may even reach a person or two. So- a bit of the real world, here; it's October. And for the first time since I built the Little House- we didn't have the wood stove in operation during September, not once. In a normal year, there's a week or so of cold, often rainy weather, when we crank up the woodstove for the first time of the season; we need to stay warm. But not this year. We had rains; but they were warm, and came all in one day, not slowly over 3. It never even occurred to me to light the stove. The woodstove is a huge part of autumn and winter. It changes how we cook (you can't bake potatoes on a propane burner - or pies) - changes our work- the need for wood, and feeding the stove takes precedence over almost everything, when it's zero outside. It changes our eye on the weather- if a storm is coming, we need to get wood under cover in the shed, before it gets wet, or buried in snow. I enjoy it immensely. A tick of the seasonal clock. I love sitting where the radiant heat warms me- chilly on one side, over-toasty on the other. I love splitting wood, in fact, and doing all those little chores involved in keeping my family safe and warm. So it was a shock when I noticed it was October; and no stove. Yes, I'm afraid it really is global warming, our constant companion, again. Actually, I know for a fact that I've burned far less wood in the past 3 winters than was usual in the '70's and '80's. Doesn't mean I don't still have to prepare and think ahead for a "real" winter- that can still happen, of course. My biggest problem with wood last year was... mud. Usually we move firewood to the house on snow sleds. I arranged things originally so the wood yard is out in the sun- and uphill from the house. The wood dries nicely out there, and it's pretty easy to get a sled load, and just guide it as it slides downhill to the house. But sleds don't work well on mud- nor do wheelbarrows. I had to just carry it in my arms more times last year than any other I recall. Changes in our lives; here now. So- the video here is just for fun; and because I've just figured out how to include video, since I updated my browser. It's around 18 megabytes; hard on a slow connection- ... This is Smidgen, of course; running for the pure joy of it- it's a new concept for her. Then to my surprise, she stopped- and started to sing. I was so lucky to catch it. Can you tell what she's singing? As everyone in the green community knows, we are constantly concerned with the question "do we make any difference?" Way back in June, I posted a chunk of my own belief and philosophy -Pushing on Icebergs. Today, the BBC has an article that should keep our faith up for a long, long time. In a pretty extensive poll, across 21 nations- it turns out that the great majority (average 79%!!!) of people now believe global warming is real, caused by humans, and needs to be dealt with urgently. Folks, the numbers they cite are huge; and most importantly, a huge change. We need to savor this, very carefully. It's a lesson we're still going to need to recall in the years ahead; that iceberg is moving- but where? And who's pushing on it now? Not everyone is pushing in the same direction, that's for sure. Part of what made the iceberg move was purely the personal commitments of those doing the pushing. While there are many many times when we leave discussions feeling futile- when you are honest and sincere- and quietly persistent- you DO leave those in the audience with a positive impression. And little by little- their minds do change. It's really not enough to just read about all this climate stuff in the newspapers, or see it on tv - the skeptics have to see for themselves that there are serious people - people they know- who believe in it. That's you and me. Next- the politicians. Tricky- in all possible meanings. But, as we've seen in the last months, the politicians DO follow the public trends, they have to. And yes, we, you, all of us - are changing the way the public- the world- thinks. Now, everybody get back to work, there's more to do. Having a hard time figuring what to write about here. Too many conflicting tugs. b) my stupid back has gone "out". Well, "half out". Partly from doing a lot of heavier than usual work; but it happened when I just stepped down off the tractor. A tiny twist; a little compression- ah, lower back in spasm. Can't really stand up, or walk, at this point. Taking meds- not helping much. I CAN sit, which is why I'm at the computer. c) it's damned hard to whine about my stupid back when Crunch has such trouble. d) Anonymous left a comment on my post "Things could be worse" - saying (quite politely) I couldn't legitimately complain about my insurance company not covering my stolen truck, when I hadn't insured it... oh, yes I can, and will, in a later post. "Predatory businesses" being one of my listed topics. But it still seems too trivial compared to Crunchy's situation. e) all the kind comments on my poetic endeavors are very seductive. Hm, maybe I should just do a poetry blog... the ego would love it; but it's not really what we're here for.. So, I'm stuck. So, I'm going to revert, and put two more poems here- relevant to the season, and I hope life affirming. It's a beautiful autumn day here; cool, crisp, sunny. These were written on very similar days. I've been debating for some hours whether to do this or not- but what the heck; what's the blogosphere for, if not shameless self exposure? Just ask Deanna and Vanessa! Yeah, I've dabbled in poetry. But like others, it only seems to come when I'm miserable. Not writing these days; too busy. This was written for a woman who was not there. She never saw this. The event was exactly as described, but the romance never happened. This was the 56th written for her. Musta been pretty miserable, huh? :-) She's gone; but the day and the poem remain, and I have Spice and Smidgen to walk with now. There's a special autumn event I look for every year. It doesn't have a name. Actually, I've never met anyone else who has seen it, or heard of it. A fact that makes me think, and wonder if that should worry me. Us. It's quite a spectacular thing, when it happens. Spectacular as it is, though, it goes unnoticed; partly because at the best, it can only last for a half an hour. No more. And it doesn't happen every year, either. It used to happen most years, at least in part. Now it happens less. That worries me, too. In a good year- meaning one with good rainfalls, good growing weather- we go into autumn with the trees having their year's work fully completed. The leaves are drying, getting ready to drop; all the nutrients that can be recovered already pulled back into the tree for storage. That's what the fall colors are about, of course, the leaf machinery has been shut down; the nutrients sent back for recycling. Several species of trees, particularly those with "compound" leaves; walnuts, hickories, ashes- often reach a state where few leaves have fallen yet, color is rather minimal, yet the leaves are finished, and the "abscission layer", the exact area where the leaf is attached to the tree, is fully mature; the leaf is separated, but still, just, hanging on because of a little residual "glue". A compound leaf, you understand, is one that has a central rib with maybe 5 to 9, or more, leaflets on it. It's really one leaf, cut up by nature; and the whole thing is shed when it's time. Then comes the first frost. Here, that almost always means a day when a fierce blustery cold front has been moving in, rattling branches, leaves, and teeth, all day. Like magic - year after year- the wind dies to dead calm exactly as the sun goes down; leaving the crystal blue autumn sky fading through all possible blues to black. The stars appear, almost unblinking in the winter-like clarity; the wind stays still; and we know, going to bed, that there will be frost tonight. We usually don't light the woodstove, but just put on sweaters and extra blankets; we know the heat of "Indian summer" will certainly follow this day or two of winter previews. You have to be IN the woods to see this. And you have to be up before the sun. And you have to watch every year; because sometimes- it doesn't happen at all. The air, typically, is still dead calm. The stars are starting to fade as the sun, still below the horizon, brightens the eastern sky. No red in the sky- no clouds to make it. The coffee in my hand is hot; and welcome because it's cold, since I've stubbornly refused to light the fire. The sky gets steadily brighter. Then- the sun touches the highest leaves. Nothing happens. Well, the ice has to melt, you know; it doesn't happen instantly. How cold is it? 33°? Should melt fast. The leaves get colder than the air, as they radiate their heat to the black cold of space. This is true- the air temperature can be 35°, even; and if the air is still and the sky clear- it will frost. Or is it colder? 26°? It will take longer to melt if it's cold. Will it happen? Or is this not the right year? Then- in the right year- from the very top of the tallest ash tree- an entire compound leaf detaches; in the totally still air- and drops. Sails, is more like it. They can float down like kites with broken strings, shifting, drifting, changing directions- and bumping other leaves. Then another. And another. The sun only moves up; the warmth only increases, the ice melts faster, the leaves let loose in great shoals, schools, flocks. Sifting down through the branches; knocking some non-participant maple and elm leaves off, too. All in total silence; no wind, no sound. Except the sighs of the descending leaves. In my memory, even the birds are silenced by this astonishing forest-wide event. Everything stops to watch. And the whole woods whispers. For perhaps a half an hour, the sky rains leaves. Quietly, with only the occasional drip of melted frost to accompany the swish of the sailing leaves. What happens when some compound leaf loses a leaflet or two on one side? Unbalanced, they twirl, and swirl, and... well, dance is the only word. Each an individual; a sky full of brilliant, flashing, variations. Walking in it is transfiguring. Walking through it with a loved one- moreso. Walking through it with a small child- neither you, nor they, will ever forget. It's a throat-hurtingly beautiful thing; a rite of change I've shared with my loved ones whenever I could. This is IT; the exact instant of change, from summer to fall- the world has turned, successfully, once more. That "successfully" bit is not a given, you know. I hope you can see it; a little, here. And I really hope you have the chance to see the .. hm. The Last Dance? in real life, someday. It's not easy to do; you can't sell tickets to the leaf peepers, the actual event is far too unpredictable. If you don't actively seek it out, you'll never see it. I'm sure ash trees in cities do drop their leaves this way sometimes- but it's not the same as walking through a forest, where it's all happening at once. It didn't happen, this year. We got the frost; and the clear clear night; but the trees were oddly on both sides of the equation; the walnuts had all dropped their leaves weeks ago, when drought turned to flood. And the ashes. But hickories, strangely, are still brightly green. Even if the hickories decide to drop at a later frost, the "whole forest" thing can't happen. Of course, I'd been looking forward to showing the Smidgen. Watching her watch with her wide, wide "2 anna HALF" year eyes. Chasing leaves. Seeing the world turn. Not this year. I'm not greatly disappointed- I'm pretty sure there will be other times. But I do wonder, and worry. When I first lived here, this was something that happened pretty reliably, 2 years out of 3. But in the last 10 years- it's only happened twice, I think. Too many climate signals drifting away from their original settings? It's not just me, the real old-timers here notice the changes, too. One of the points this leaves me pondering is- how much of our world do we miss- or misunderstand- because critical pieces of it simply go unseen? Any student of human behavior will tell you that humans mostly see what we expect to see; what we're taught to see. I don't know anyone else who's ever seen, or noticed, this Last Dance; spectacular as it is. I HAVE had a couple visitors who were here during one- and still didn't SEE it, until I pointed it out. What else, on this earth, have we just never seen? Never noticed? We humans are so short lived, really- and so self occupied. And still we assume, even the most careful of us, that we have a reasonably good idea how "things" work here. I have my doubts. And some evidence. And how do we learn; and how do we teach- how to open our eyes?